Maybe the universe is trying to tell me something. I was recently sent not one, but two different books about protecting yourself against evil or malicious entities or magic users to feature on The Magical Buffet. This has always been an area of research that interests me, and my bookshelves are a testament to that fact. Still, two books in one month. I can’t help but wonder if the universe is onto something that I haven’t figured out yet. Hopefully I’ll be sharing an interview with the author of the other book I received, so I won’t be discussing it here. 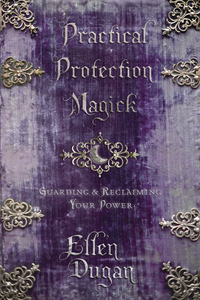 Today I’m going to talk about “Practical Protection Magick: Guarding & Reclaiming Your Power” by Ellen Dugan. Readers may remember that I interviewed Ellen Dugan back in 2009 when she was promoting “Book of Witchery”. Although straight forward and hopefully informative, the interview doesn’t do justice to Dugan’s casual, witty writing style. That’s a “my bad” on my part. That part of Dugan’s personality is polished to a shine in “Practical Protection Magick”. Unlike many books I own that discuss protecting yourself from magical or psychic effects, Dugan focuses more on you than what’s going on outside of you. Through some simple to take quizzes you determine your psychic specialties, and then learn what that means in terms of your strengths and weaknesses when confronted with magical or psychic attacks. Dugan focuses on self-esteem, physical fitness, and awareness. The more confident you are, the less likely you are to become prey to an attack. The concept of knowing, claiming, or reclaiming your own power is a big part of the work Dugan suggests. Not only does she address genuine magical means of being under attack, but also talks about dealing with emotionally draining people and drama queens. They may not be magical, but Dugan assesses their actions as just as damaging as intentional magical attack (which I agree with). And I should also mention that “Practical Protection Magick” emphasizes ruling out other things before jumping to the conclusion that you’ve been cursed, hexed, given the evil eye, or any other magical or supernatural attack. “Practical Protection Magick” is a well researched book dealing with magic and the supernatural, but what makes it stand out from the crowd is its “self-help” angle. Many books will list protection deities or crystal and herbs for protection (all of which are featured in this book too), but Dugan’s emphasis on self improvement as perhaps the best, and most consistent means of protection is unique and a welcome change of pace. Reading this book feels like getting advice from one of your very good friends: it’s a pep talk, a cautionary tale, and loaded with words to live by.